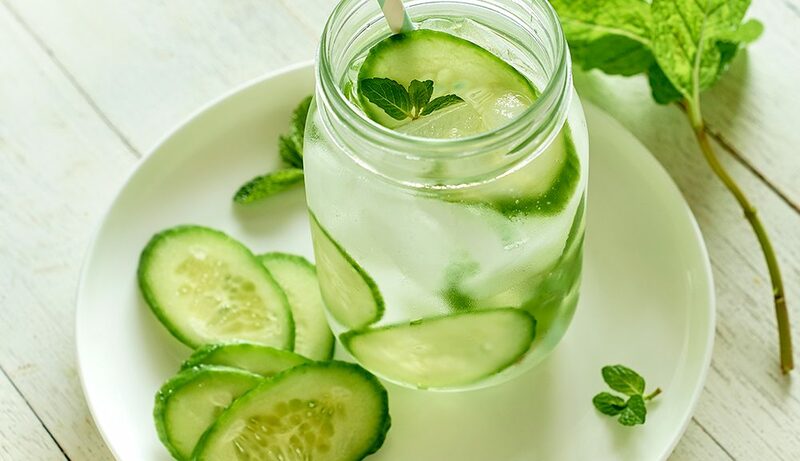 We all know how good water is for you, but did you know you can supercharge your drinking water by adding some slices of cucumber to it. Here’s why cucumber is so good for you. Cucumbers are full of antioxidants which help your body to fight free radicals, prevent sickness and keep us fit and healthy. Having too much salt and too little potassium in your diet is a contributing factor to high blood pressure. The great thing about cucumbers is that they are packed full of potassium, but contain very little salt. This regulates the amount of sodium that is retained by your kidneys, which can help lower your blood pressure. Cucumbers are a great source of vitamin K, which helps form the proteins that are necessary for building and maintaining strong bones. Vitamin K is needed to ensure your blood clots properly, while it also helps prevent heart disease. Cucumbers are high in pantothenic acid or vitamin B-5, which helps your skin retain moisture and maintain a healthy complexion. Cucumbers also contain cucurbitacins and cucumerin, which are compounds that help reduce inflammation and the signs of aging. If you’re trying to lose weight, drink lots of cucumber water. Not only does it taste great, it will also make you feel fuller for longer and more importantly deters you from reaching for sugary drinks to quench your thirst. Also, cucumbers are a natural diuretic so drinking plenty of cucumber water should help with bloating and improve digestion.